The Sony 6R-33 is a recent discovery for me having flown under the radar since 1968 when it was introduced. There is almost no information about it online and I was not previously aware of this model. Mine was graciously sent to me by a reader who had more than one and thought I should review it because he likes it very much. After having used the radio for a while I tend to agree with him. He had also recapped the radio sparing me the necessity of doing that…thanks! I did re-check the alignment to be sure it was absolutely as good as it could be. The 6R-33 is an early example of Sony’s “Super Sensitive” line of radios…a name they carried into the 80’s with series after series of high-performing portable radios, several of which I own or have owned. 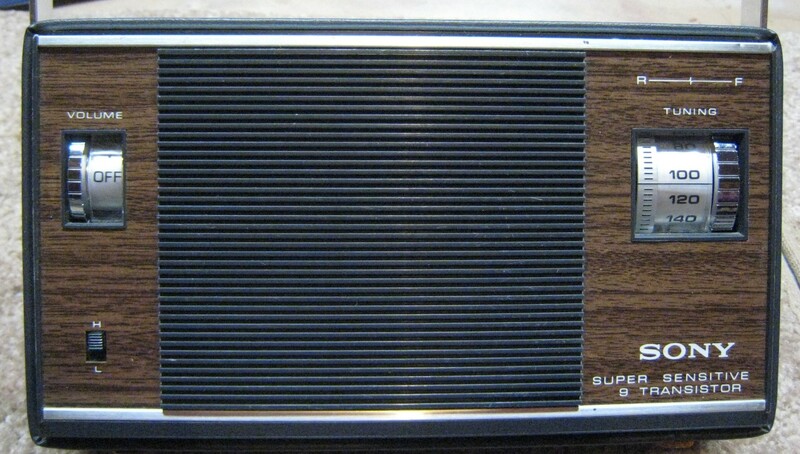 The 6R-33 is an AM only, 9 transistor radio with a three gang air variable tuning condenser and a tuned RF stage, along with a large ferrite rod for excellent AM reception. Styling is distinctly 60’s with its faux leather and wood grained cabinet. Running for hundreds of hours on 3 D cells it features a very nice vernier tuning dial and two positon tone switch – other than that it’s a simple, straight-forward design. 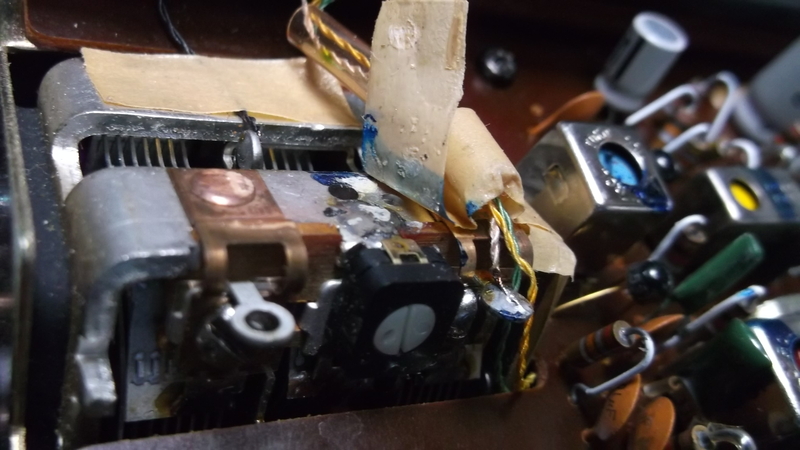 While studying the radio I thought it had been repaired with a replacement vari-cap soldered to the tuning gang…the center adjustment which is CT3 – the Oscillator Trimmer. 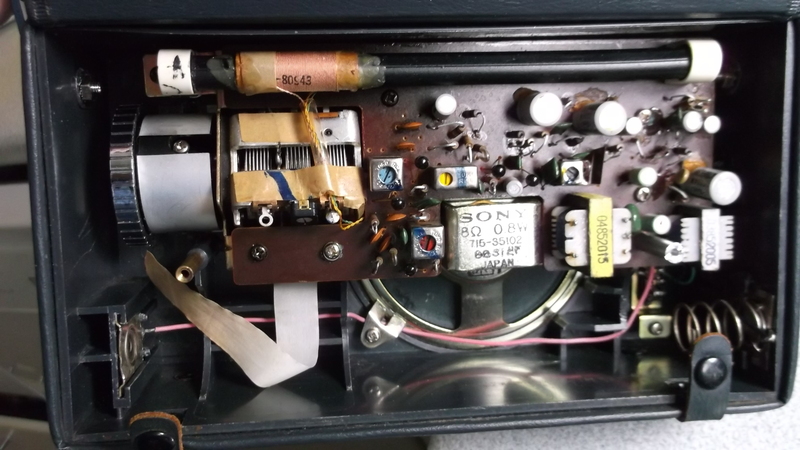 However I discovered after seeing a few internal pictures of this radio online that this is how they came from the factory…perhaps they could not achieve the right adjustment range with a standard trimmer right on the gang as the other two trimmers are. The radio won me over right away. It feels like a solid brick, I like the feel of its fine vernier tuning, and it has a pleasing tone quality. The amplifier is rated at 240 mw average and 400 MW max which is enough to convincingly fill a large room. Reception also seemed pretty hot so I compared it with some familiar radios and soon placed it at *** on the AM Mega Shootout List, where it holds its own with many other well-known respected radios. The Sony 6R-33…one of many great Sony “Super Sensitive” portables. Recommended!